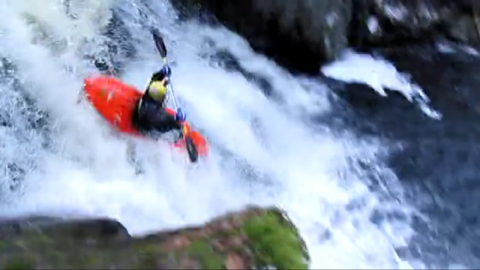 Pushing Your Limits | DBP MAGAZINE ONLINE The World's Best Free Whitewater Publication. The time; 4:00 am Sunday morning. Even though I had set my alarm for 7 am I was up, wide awake checking the gauges, using Google maps to find the distances between different runs to try to cram as much whitewater bliss into one day as I could. Some people might call me crazy, and I won’t deny that there is definitely a certain drive within me that contains elements of crazy. I would not call myself crazy though, just highly motivated. It takes a certain type of individual to want to push the limits and explore new sets of challenges in any aspect of life. 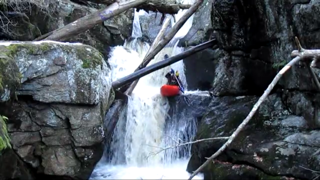 Since whitewater paddling is a widely misunderstood sport, this often results in top athletes being shot down as adrenaline seeking junkies instead of talented and creative athletes(as we saw with Dane Jackson surfing on the Black River earlier this year: http://www.wwnytv.com/news/local/Feedback-Crazy-Or-What-Kayakers-Ride-The-Black-River-255706511.html). 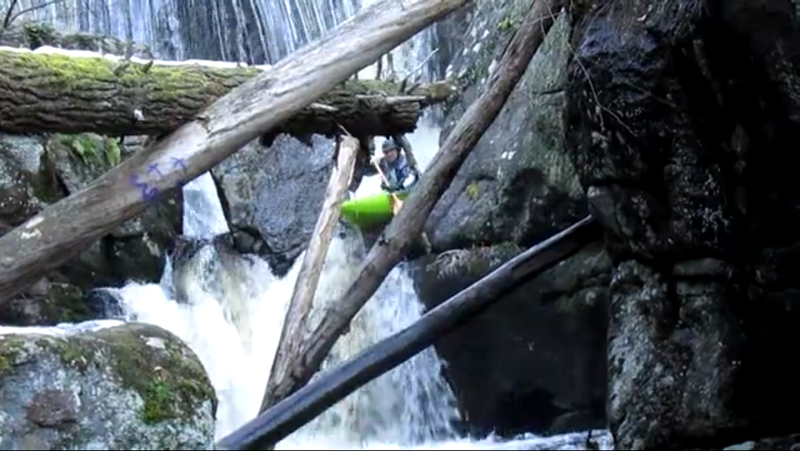 While I am certainly not a top professional whitewater kayaker, I am a talented, sponsored athlete. 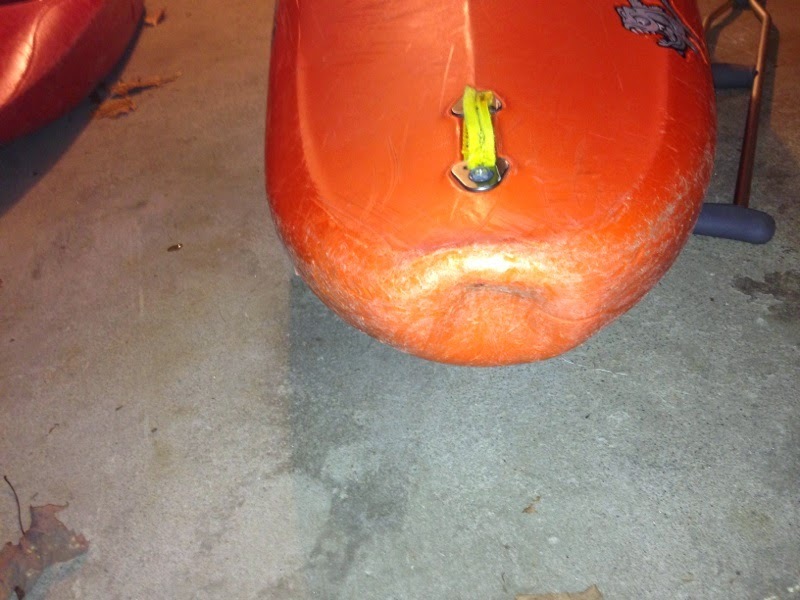 I have been kayaking for 7 years now, although I have only been running class 5+ for the past year or so. Around 7 am Sunday I agree to meet my friend Ben at a set of waterfalls in Massachusetts, about an hour and a half drive from me. On the way there, two other friends of mine; Nate and Jon text me to let me know they will meet us there at 10 am. I arrive first, and quickly stash my boat in the bushes so as not to attract attention as to our intent. Soon everyone arrives and we all walk down to take a look at the falls. Me, Nate, and Jon have run these particular falls several times before, while they will be a personal first descent for Ben. After looking at the river we decide the water is a nice medium-low level. Since I arrived first, I am already geared up and ready to go so I set up my camera on a tripod while the others change into their gear. Finally six hours later from when I woke up, it is time to get on the water! Jon puts in first while Ben shoots video and Nate takes pictures. I slide into the water after him and we both have nice clean runs! Excitedly I eddy out and jump out of my boat to go film Ben and Nate. Unfortunately I find Ben and Nate talking to a park ranger who is asking us to leave. After taking down her information and contact information for her office (so we can attempt to obtain future access for this run) we respectfully leave. Jon and Nate head to another river closer to home. Ben heads home to meet his family for lunch. I drive another hour and a half to meet my friend Mike at Enders Falls; a set of waterfalls in Connecticut. 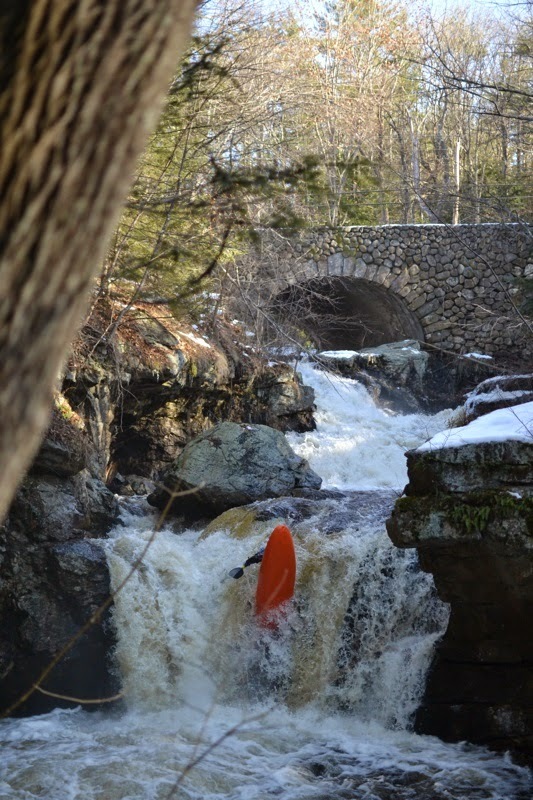 Mike was originally planning on running the falls in Massachusetts with us as well but woke up a little late so decided to meet me at the Still River in Connecticut. On his way I ask him to check Enders to see if there is enough water to attempt a run. He lets me know that there is so I head there to meet him. We quickly determine there is not enough water for the first drop, but the second and third ones look good to go. The second is a slide into a fifteen foot vertical drop. The third is a three tiered drop (15 feet followed by two 6 footers) which lands in a big pool before plunging off a big 25 footer with a reconnect halfway down. There are several big pieces of wood blocking the last 6 footer, so Mike and I spent about an hour or so roping the logs out to make it “runnable”. 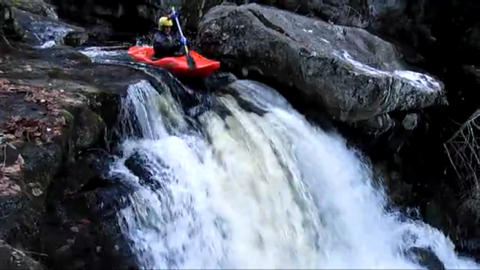 Finally satisfied with our efforts, we decide to head back up for our boats and camera to run the falls! on my way back I slipped on a patch of ice underneath some leaves by the 25 footer and fell into the river and right down the drop itself! Fortunately I always wear my helmet and the rest of my gear while scouting out rapids and I was completely fine. Mike on the other hand looked like he was about to have a heart attack as I climbed out of the water….Both shaken but laughing we headed up to our boats and fired up all the drops successfully (although the water was a little low) including what we are fairly certain was a first descent of the three tiered drop. After a strenuous hike with our boats back up to our cars, we decided to head to the Still River to do a final quick run. 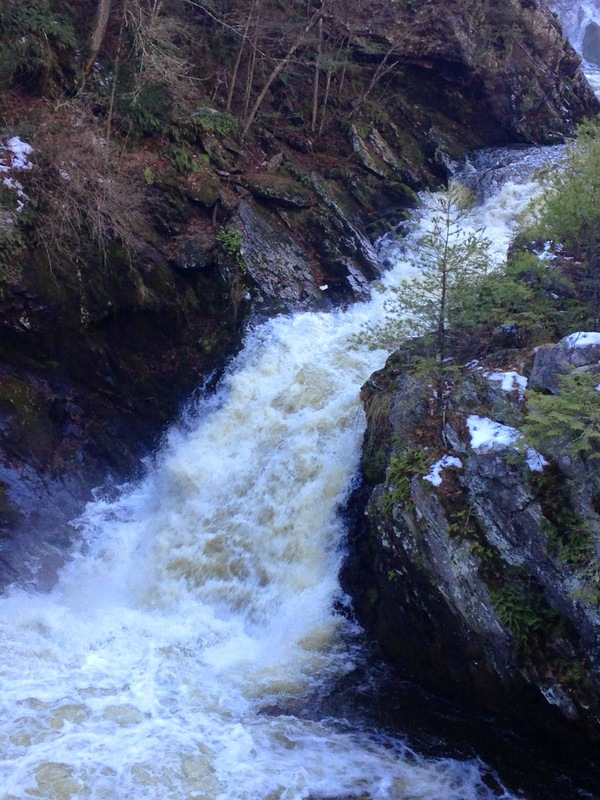 We arrived at the river at about 3:30 and began the slight hike into the gorge section to run the top class 5 drop. By the time we hiked down and lowered our boats into the gorge it was beginning to get dark out. We still decided to put in reasoning that there was just one class 5 drop and then just boogie class 4 water after that to the takeout. The whole run is only a half a mile long and we easily could have made it out by dark. Mike put in and I watched with a rope as he ran the big drop. At levels of 200 cfs this drop is rated a 5.1. When we put on the level was somewhere in between 480 and 550 cfs. The line involved moving from river right to river left, punching a big wave hole at the lip of the final near vertical 15 foot drop, and boofing to avoid the monster hole that lay below. Mike had run this drop before at lower levels, but I had not. I watched as he was stopped by the wavehole at the lip of the drop, pushed far right off the final drop, and barely managed to surf his way out the hole. Then I put on, reasoning that I saw how pushy the move was, so was better prepared than Mike was, and that he side surfed out of the hole, so how bad could it possibly be? Looking back, I know if I were to run it again at the same level, I could make the move successfully, however I should not have run the drop; in fact neither of us should have run the drop that late in the day tired and with no backup for safety, committing ourselves to being gorged in for a bit, at least a half mile from the road at the verge of dark. Foolishly, I dropped in only to have my contact splashed out of my right eye right in the lead in to the drop. Legally blind without contacts or glasses I knew I was not in a good situation yet I wasn’t too worried. I paddled hard for what I thought was the line, only to be stopped as Mike was at the wavehole above the final drop. I felt myself pushed back right and fell over lip with almost no momentum at all just to piton on a rock in the falls itself. At this point I was slightly more worried, especially since my left leg had came out of my knee brace from the impact. I felt my boat fall forward as I fell upside down into the hole at the base of the drop. I immediately rolled myself up landing in a very violent sidesurf. I paddled as hard as I could, thinking I could make it out of the hole. Just as I was beginning to make progress, I felt my stern pushing down into water as I was backendered and flipped into the hole yet again. I tryed to set up to roll but couldnt get my paddle into position and felt myself being pulled deep while still in my boat, so I bailed out. At first I thought I was gonna be fine, I was swimming towards the surface and the aeriated water was just hitting my face when I was taken back under. This happened to me three times in a row. In fact one of these times I was so close to the surface that my gopro camera broke the surface of the water (shown in the video footage) before being pulled back down. Now I was tired, cold and running out of options. I dove down trying to catch some outflow of water towards the bottom. No luck there. I knew I had maybe one or two more chances left before I passed out, I honestly thought at that moment that I was going to drown. Mustering up all my strength for one final attempt, I dove as deep as I could and felt a rock at the bottom of the river that I grabbed onto and used to push off of and guide me further from the powerful hydraulic. Finally, after what seemed like an eternity I made it to the surface where Mike was waiting for me. I grabbed the back of his boat and he took me to a small island of rocks near shore where I threw up small amounts of water I had swallowed. In the aftermath, I discovered my elbow pads had been ripped off me in the hole and I had lost my paddle and poogies in there as well. My boat was worked in the hole for a good 5 to 10 minutes before Mike got it to shore for me. 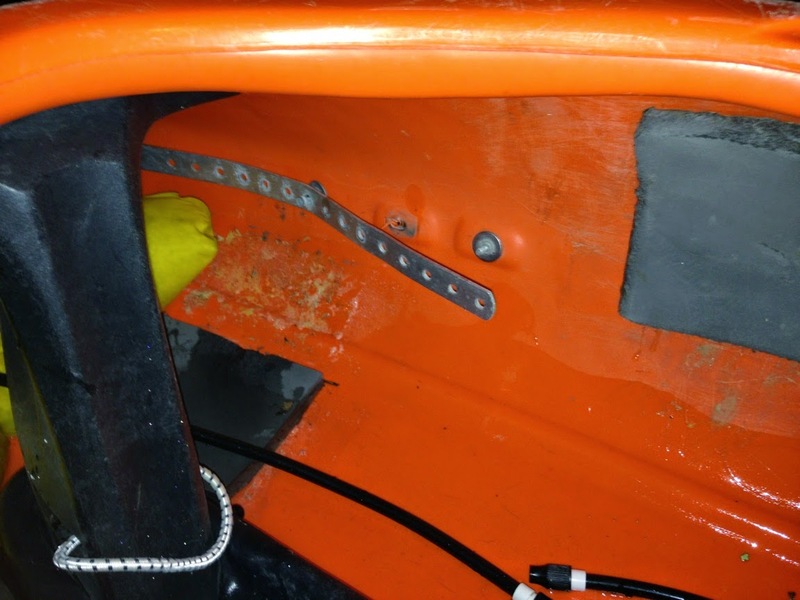 One of the bolts that held the foot-pegs in place had been ripped out, leaving a leak, as well as a leak in the back where the stern had crumpled in. 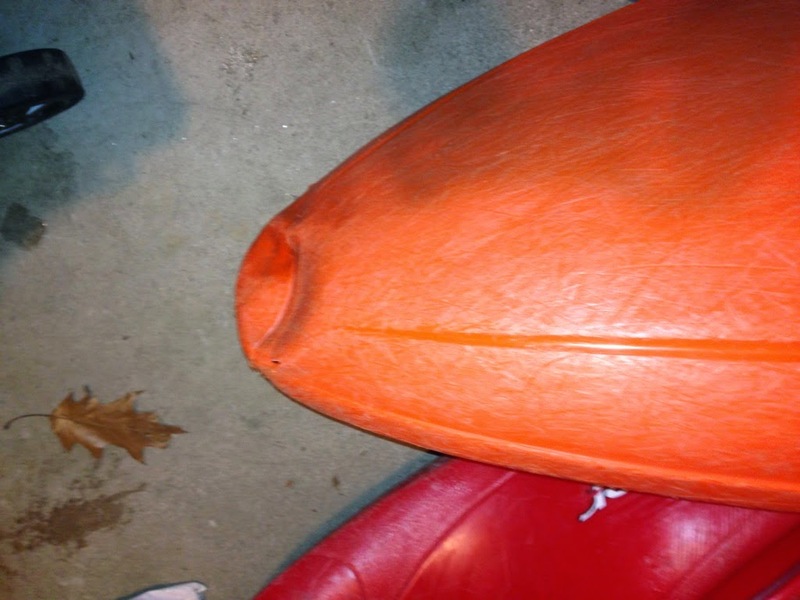 The bow was dented in from the initial piton, and my bulkhead had been ripped out of the boat. I could not stand or walk and had to sit on top of my boat with my knee out and drift down and out of the gorge. 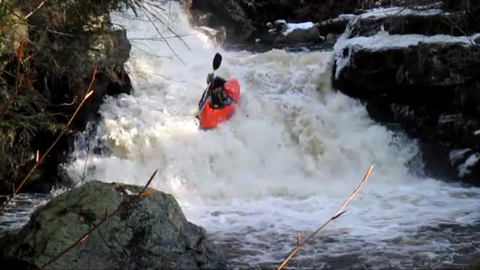 Once out of the gorge, Mike headed downstream to takeout and walk to the car before hitting any further whitewater, and I lay on top of my kayak and used my good leg to push myself like a sled across the snow towards the road (several hundred yards). Finally I got close and Mike arrived with my car. 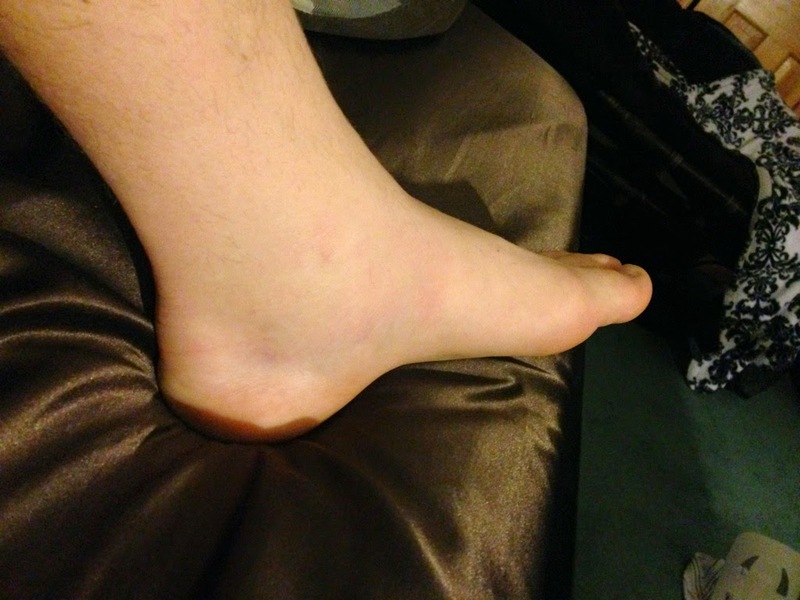 After a visit to the ER and orthopedics, I was told I torn my Achilles tendon and I will be out for 2-6 weeks depending on how quickly I recover. Looking back I got lucky, and realize that while it is fine to push myself, there is a time and place to do so. I have learned a valuable lesson and next time around I will have better judgement. Huge thanks to Mike for helping me out, and hope this is an eye opener for others as well. Stay safe out there. 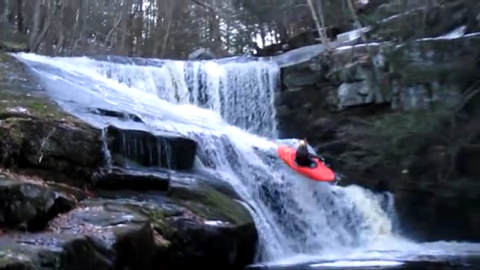 DECEMBER 7TH CREEKING from Alex DePue on Vimeo.